God’s first words in Genesis summoning light to the dark void of the silent, uncreated world are a preview of the flames that will brand Christianity with unity. Church diversity was born on the day of Pentecost and thrives in the global community of faith by channeling the Holy Spirit as a spontaneous Rosetta Stone language course. 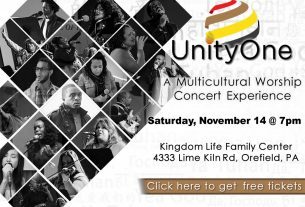 Today, Unity One is expanding the frontiers of faith with cross-cultural dialogue that transcends the boundaries erected by speech, culture, and tradition. But dialogue in Genesis is limited until a fallen angel with the gift of gab engages the First Couple in a bait-and-switch con game that exchanges forbidden fruit for sin. The Genesis God who speaks when He’s forced to cast his beloved Adam and Eve from Eden is represented as the scolding God, the gotcha God, the God of fear, until, centuries later, the gospels bring Jesus Christ, God-with-us, a man who willingly shares our suffering, and returns us to the God who never stopped loving us. Jesus greets the outcast, welcomes the foreigner, and calls the Gentile his brother. The Son of God who teaches his disciples to accept the hospitality of the stranger is preparing them for a much bigger and broader, richer world than they’ve ever known or expected to know. In Acts 2, the Holy Spirit erupts upon the tomb-trumping Christians who, after hiding in silence for fifty days following the death of their leader, suddenly have plenty to say. Exulting in their conversation, the Holy Spirit removes the barriers of language to create a multiethnic congregation: Cretans understand Judeans, and Medes share the speech of the Egyptians, and the Romans comprehend the Elamites. As tongues of fire dance above the heads of the strangers who have gathered in Jerusalem, and the potent wind of community rushes into their midst, they are strangers no more. God is not a cranky librarian saying “shhh” to his noisy offspring. 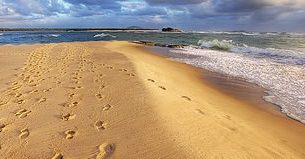 Embracing the world opens us to God’s presence and possibilities. 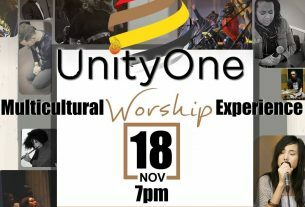 As Unity One describes it, we understand the Spirit of God better when we are part of worship that extends our own personal boundaries. God is in our midst, the stone is rolled away, and the Pentecost people are pillars of fire as multicultural worship celebrates its birthday every time worshippers join in song.